A peach is the love-child of a sweetly exotic mango and an acerbic privileged lemon. Luckily, it inherited the carefree wild streak from mango's side of the family. And while the uptight lemon may subtly scold the peach for it's plumpness, the mango encourages it to reach for the pie in the sky. The peach never lets anything stand in it's way of taking the lead role in a dessert, and it never over-analyzes the results it yields . The original recipe calls for the peaches to be paired with their plum cousins. And while I'm sure that would have been spectacular, I had a refrigerator full of cherries that were on the brink. Plus I know that peaches are kind enough to get along with just about any fruit, except maybe bananas (which are kind of shallow...always trying to sell you on their looks when all you end up with is a mouthful of mush). 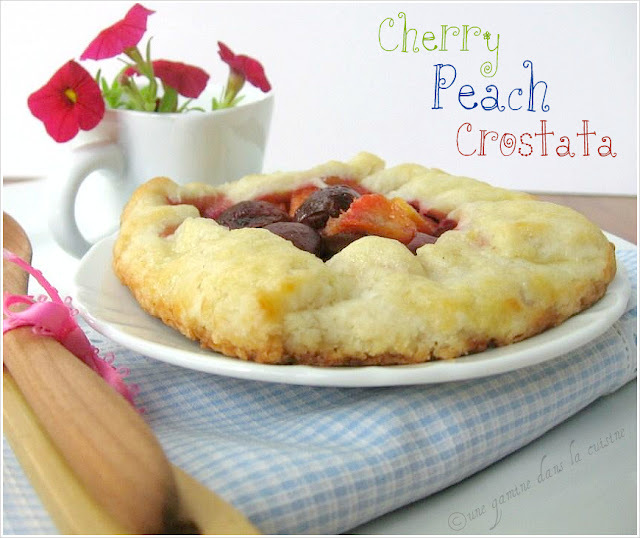 These crostatas are the perfect way to hang on to summer. And I am determined to cling to it like a koala on a dystopian eucalyptus tree. The pastry is buttery, and crumbly, while the fruit filling is sweet and irresistibly juicy. Turn the dough out onto a well-floured surface, and gather up any loose pieces that may have escaped the blade. Roll the dough into a ball and cut it in half. Form each half into a disk (if you're making four crostatas, divide the dough into 4 disks.) Wrap each disk separately in plastic and refrigerate for at least 3 hours. Whatever dough you don't plan on using can be frozen for about 2 weeks. Get ready to bake: Preheat the oven to 450 degrees F. Line a baking sheet(s) with parchment paper. Lightly flour a work surface, and remove one disk from the refrigerator. If the dough is too hard to roll, let it rest at room temperature for about 5-10 minutes. If you're making 2 crostatas, roll each disk into an 11-inch circle. If you're making 4 crostatas, roll each disk into a 5-6-inch circle. Transfer the circles to the lined baking sheets and set them aside while you prepare the filling. Cut the peaches into 1/2-1-inch chunks and place them into a large bowl with the chopped cherries. Toss them with 1 tablespoon of the flour, 1 tablespoon of the sugar, the orange zest, and the orange juice. 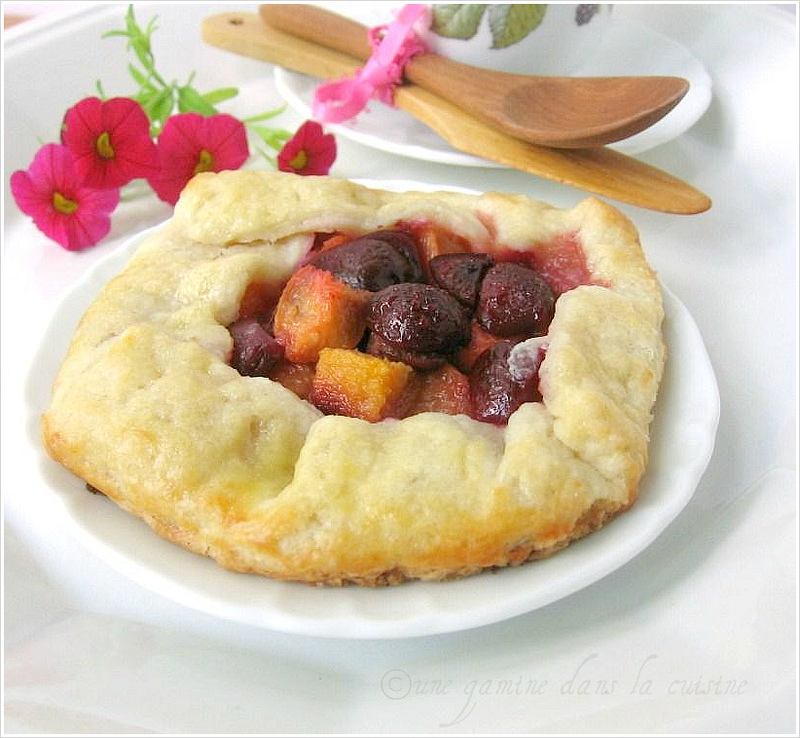 Place the mixed fruit on the dough circles, leaving a 1 1/2-inch border. Sprinkle each crostata with a bit of raw sugar (or granulated). For large crostatas, bake for 20-25 minutes. For the smaller crostatas, bake for 13-20 minutes. The crusts should be lightly golden and the fruit should look tender and bubbly. Once they're out of the oven, allow the crostatas to rest for about 5 minutes before carefully removing them from the sheets. Serve as soon as possible with or without ice cream. I've never made crostata, maybe it's time to start. This just sounds scrumptious! Thanks for sharing. What a delightful combination! That crostata must taste divine. I've just pulled my peach cobbler out of the oven, and now I see your post. Time to go back to the farmers' market! I am way behind in my blog reading. I just wanted to say this looks amazing! I love pretty much anything with peaches and/or cherries, and this must have been awesome. Rustic and beautiful. Gorgeous work, as always! I can see how tender and flaky the crust is by just looking at the photo! 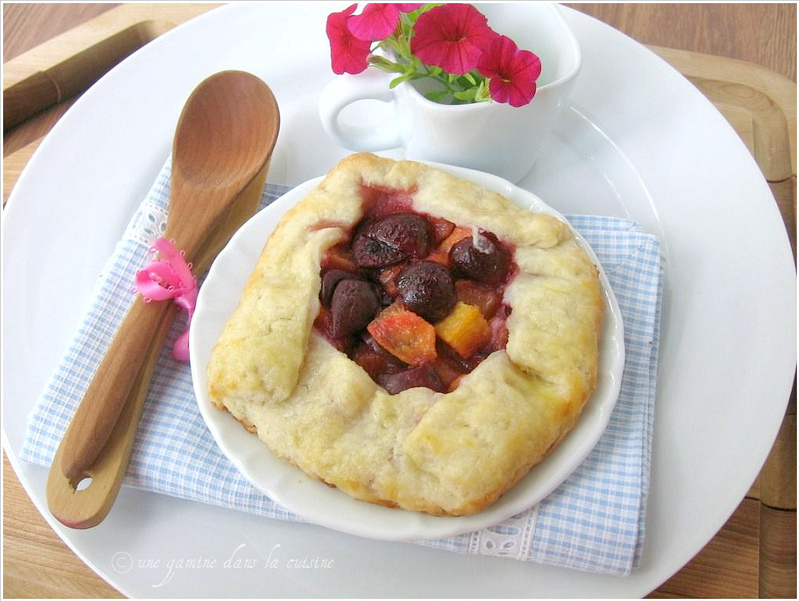 Love the rustic tart! YUM!